Singer Alexandra Burke has been voted the winner of The X Factor, beating four-piece group JLS into second place. The 20-year-old from Islington, London, who made an unsuccessful bid to be in the contest three years ago, was widely praised for her final performances. She sang with her idol and US star Beyonce, and performed her version of Leonard Cohen's Hallelujah, a sure bet to become the Christmas number one. Northern Ireland teenager Eoghan Quigg finished in third place. 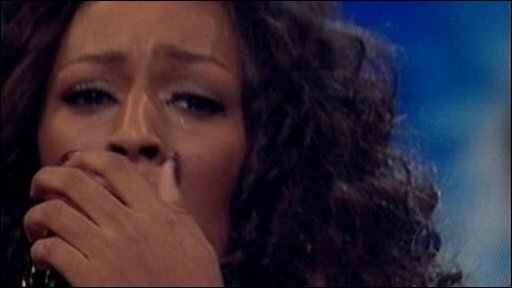 Burke, who has landed a £1m recording deal, was very emotional after hearing the news, but eventually said: "I am the happiest girl alive". She was presented with a copy of her debut single, and dedicated it "to everyone who voted for me". Simon Cowell said he was "speechless" after Burke scooped the crown, adding: "You deserve it". The song became available for download after the programme, with the physical release set to hit the shelves early next week. Overnight ratings estimated that both the main X Factor show and the later results programme attracted 13.2m viewers on average, over half of all TV viewers at the time. Burke was mentored by Girls Aloud star Cheryl Cole, completing her first season as a judge on the show. She emulates the feat of Dannii Minogue, who won with Leon Jackson last year during her initial stint on the judging panel. Burke is to perform with Sir Elton John at the O2 Arena in London on New Year's Eve. 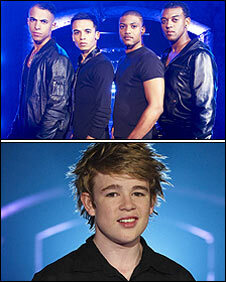 JLS, who were under the guidance of Louis Walsh, looked very disappointed, but vowed to pursue their dream. The act performed with Irish group Westlife, one of the most successful chart acts of recent years. Quigg, 16, exited the ITV1 show earlier in the evening after polling the fewest votes of the three acts, leaving JLS and Alexandra Burke still in the running. The singer from Dungiven was mentored by Simon Cowell and performed with Irish group Boyzone during the live show. Cowell said Quigg could leave the programme "with his head held high". X Factor presenter Dermot O'Leary said in the programme that eight million votes had been cast during the final.